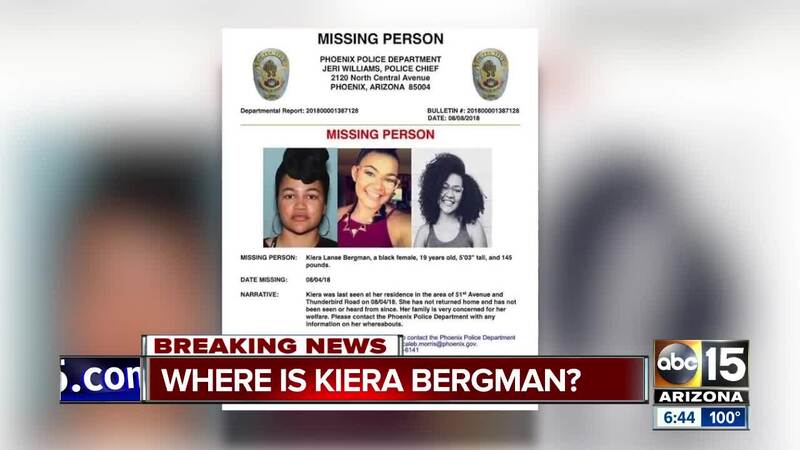 The Phoenix Police Department says the ex-boyfriend of Kiera Bergman, a 19-year-old girl who has been missing since August 4, has been arrested for identity theft. The Phoenix Police Department says the ex-boyfriend of Kiera Bergman, a 19-year-old woman who has been missing since August 4, has been arrested for identity theft. Police say 23-year-old Jon Clark was being questioned in relation to Bergman’s disappearance when police found several items with the personal identification of other people as well as items indicating forgery in his vehicle. Clark was arrested Friday and booked into jail for 22 counts of aggravated identity theft and two counts of forgery. Police have given no indication that this arrest connects Clark to Bergman’s missing person’s case. Bergman was last seen at her home near on Aug. 4. According to police, Bergman never returned home after leaving and has not been seen or heard from since. Kiersten Bragg, Bergman's mother, says her daughter went to work that Saturday morning, and Clark picked her up but she never made it back to their apartment. Police still say her disappearance is considered suspicious, and they are still asking anyone with any information on her disappearance to call 480-WITNESS.